Due to severe pollution, China has proposed a ban on all solid waste imports affecting 8.2 percent, or nearly 1 million TEU, of all US exports, according to an analysis of data from PIERS. China’s rapid economic expansion in the last two decades has occurred at the expense of its environment and public health. In January of this year, as many as 30 cities in China were under “red alert”, due to extremely high levels of contaminants in the air. As a result, schools and factories were forced to close and almost half of Beijing’s cars were prohibited from operating. It is evident China faces an elusive enemy, greater than any terrorist organization or human threat. The Chinese government has pledged to spend over $598 billion throughout the next five years in efforts to clean up the air and water supplies. “By the end of 2017, China will forbid the import of 4 classes, 24 kinds of solid wastes, including plastics waste from living sources, vanadium slag, unsorted waste paper and waste textile materials,” China said in the WTO filing. If approved by the World Trade Organization (WTO), environmental activists will rejoice at the expense of U.S. exporters. 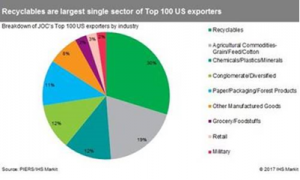 Faced with the Chinese’s governments recent announcement, U.S. exporters of these commodities will lose access to the destination they shipped 77.8 percent of their products last year, according to PIERS. This trade ban will also impact carrier lines, as they will face difficulties placing containers in China to be refilled for export, and U.S. exporters of these commodities will be forced to find new markets or develop innovative methods to recycle these goods.